I came across the Barrel Room on a night out with an old high school friend, which pretty much describes every night out I’ve had since moving to the Bay Area—I have a lot of old friends to rediscover in this neck of the woods. We wanted somewhere to extend the evening but still hear each other, which can be challenge in most bars. The Barrel Room fit the bill with its parlor-room feel, complete with a fake fire and soft music playing overhead. That sort of ambience could be considered stuffy, but it was perfect for what we wanted, especially the comfort of the dark wood tables and leather chairs we snagged at the central sitting area. 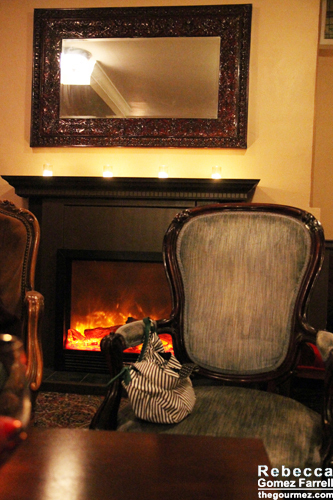 It’s a cozy little wine bar hidden past the Fitzgerald Hotel’s lobby. And I do mean wine bar; there are roughly ten beers available, five ciders, and a handful of nonalcoholic drinks, but wines are the primary ware. Nibbles have their own menu, which consists of nuts, olives, figs, charcuterie, cheese plates, and a selection of flatbreads. But I can’t report on those. We were just there for the wine. I couldn’t resist getting a flight, because I am not one to pass on variety. 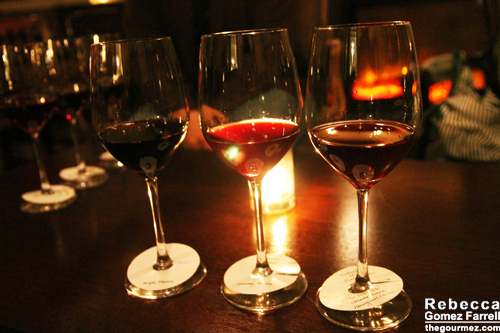 The Barrel Room has an assortment with each selection of three wines costing $15-20. Some sported fanciful names like the “Obscure French Whites” and the “Funky Reds.” The current selection is mostly French, which aren’t my favorite as a general rule—too light-bodied for my tastes. But the flight presentation was definitely to my tastes. I loved how each glass came with the name of the wine written down, because I always, always forget which wine I’m drinking when it’s merely recited for me on delivery. I remember absolutely nothing else about the trio of Loire reds I tasted, which were Clos du Tue-Boeuf Cheverny, Breton ‘Dilettante’, and Mosse Anjou Rouge. 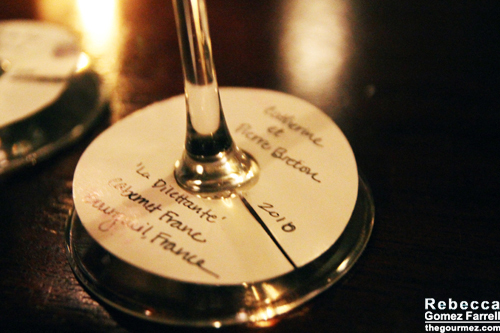 Well, I remember that I appreciated the contrast between the wines, but French reds are still not for me. More choices of origin for the flights would have been nice. Once the Barrel Room varies their flight focus, which they appear to do every so often, I can definitely see myself back in that welcoming space, spending another evening exploring wines with a friend. Okay, I’ll be honest—I probably won’t wait until the selection changes. It’s inviting enough that I’ll let the bartenders try to convince me they can find a French red for a Spanish lover like myself.